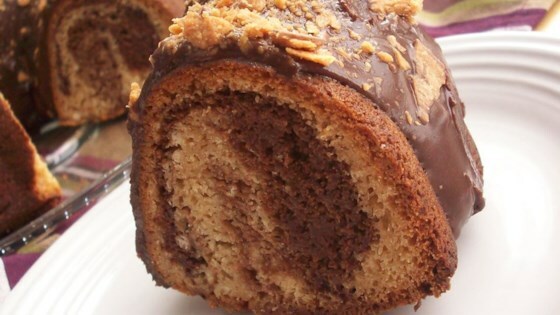 "Chocolate and peanut butter are the flavors marbled together in this marble cake recipe." Preheat oven to 350 degrees F (175 degrees C). With a non-stick cooking spray, coat a 13X9X2 inch baking pan. Dust with flour and set aside. In a small bowl, stir together the cocoa, confectioners' sugar, butter and 2 tablespoons hot water until smooth and set aside. In microwavable bowl, place peanut butter chips and shortening. Microwave on high for 1 minute, or until chips are melted and smooth when stirred. In large bowl, combine cake mix, brown sugar, 1-1/4 cups water, eggs and reserved melted peanut butter mixture; beat on low speed of electric mixer until moistened. Increase speed to medium, beat 2 minutes until smooth. Remove 1-1/2 cups of the batter and add it to the reserved cocoa mixture; blend well. Pour the peanut butter flavored batter into the prepared pan. Drop spoonfuls of the chocolate batter on top. Swirl with a knife or spatula for a marbled effect. Bake at 350 degree F (175 degrees C) for 40 to 45 minutes or until a wooden toothpick inserted in the center comes out clean. Cool and frost as desired. This is a great recipe. I substituted creamy peanut butter for the peanut butter chips and it still came out fantastic. Thanks for the recipe! This cake was very dry. I may have done something wrong because other reviewers really loved it. I didn't like it at all but some other people at the picnic said it was pretty good. This recipe is awesome!! I will definitely be making it again. It has a great flavor and is nice and moist.